Vanilla 2.2 beta 1 can now be downloaded. It requires PHP 5.3* and is NOT recommended for production environments or non-developers. You must follow the normal upgrade process, including running /utility/update. You CANNOT DOWNGRADE after upgrading because 2.2 contains a change in password hashing that is irreversible. Install it on various hosting & server solutions. Make a copy of your existing forum (away from production) and then try upgrading. File issues on GitHub (accounts are free) or start a new discussion here. Either way, mention "2.2b1" as your version. File pull requests against master and mention they are for 2.2 in the first line of the description. Test out open source plugins with it. File issues on their repositories / addons pages if you find issues so the authors can investigate. Tell us which ones already work great, too. Everything work great? Super! You can still post here with your environment details (PHP & MySQL versions, server software version, OS version, whether MySQL is in strict mode) and say everything is coming up roses. More ways to contribute to Vanilla. We pick a point and fork a release/x branch from master. We release 1-5 numbered betas (ex: 2.2b1) as we work on final fixes. No more features. We release 1-3 numbered release candidates (ex: 2.2rc1) with last-minute tweaks, usually environment-specific. We release a gold version that is officially designated with the major-point version (ex: 2.2). We then do minor-point releases with patches as needed (ex: 2.2.1). If we need a second or third patch within 24 hours of a minor-point release we may do a rare "patch" release (ex: 2.2.1p1). Support for 2.1 will cease immediately with the gold release of 2.2. The 2.0 branch has been deleted. 2.1 is now on release/2.1. 2.2 has been forked as release/2.2. master will press forward with its 2.2.100.x numbering scheme until we fork for the next version. *Note on PHP version: We always recommend the latest PHP stable release. The next major release of Vanilla will require 5.4 which may happen as early as this year. As far as the schedule for this cycle, I plan to release either b2 or rc1 the week of June 29 (in ~2 weeks). I hope for a gold release the second half of July. This cycle is focused on fixing significant, user-facing issues. The GitHub tracker has quite a few open bug tickets that will be targeted for the next version. Reporting something doesn't necessarily mean it will be fixed in the 2.2 final. Add Advanced Editor (HTML5 full drag-and-drop WYSIWYG) & remove cleditor. Add Emoji and an Emoji Extender addon to create your own sets. Add Composer support (not present in download - GitHub only). Drop use of p URL parameter. Add Section 508 support (accessibility improvements). Add support for controllers in plugins. Add spam checking & more flood control in Conversations. Upgrade PHP Markdown and split out Vanilla Markdown customizations. Add the Garden.Community.Manage permission for community managers. Allow Unicode in mentions and usernames. Allow using utf8mb4 databases (to allow Unicode emoji characters). Added support for Twitch.tv, Hitbox.tv, and SoundCloud. Add new class to handle event logging. Verify current permission before notifying OP. Allow Messages on registration page. Check UserID posting to the conversation is actually a member of the conversation. Add ForeignID to Conversations database table. Fix pager inconsistencies between discussions and categories. Update & fix Twitter and Vimeo embeds. Allow a user to disable the spam model. Embed blog comments: fix height calculation bug. Fix category URLs starting with a number. Add SkipPermissions option to NewDiscussionModule. Use redirectUrl() instead of redirect() for SSO redirects. Allow the controller method to be overridden by a controller’s initialize method. Fire an installed event for plugins to hook into. Strip tags with no attributes from user content. Set additional default permissions for moderators and administrators. Add Comments.View permission for selective permissions via addon. Fix bug where the user counts of the wrong user a re-calculated when a different user approves their post via moderation. Use the X-UA-Device-Force cookie to force a device override. Only use Garden.HomepageTitle in DefaultController. Make the mentions URL format overridable. Allow https serving of jquery.js from Google CDN. Add the current locale to the smarty variables so that themes can take advantage of it. Fix performance error in OAuth class check. Fix home link displaying twice in breadcrumbs. Add event to registration page. Allow redirect() to be called before database has been initialized. Prevent the autoloader from looking into some common non-PHP directories. Add support for file upload schemes. Default the character set to UTF-8. Increase the default conversation recipient display limit to 20. Update for vBulletin 5.1 & MyBB password hashing. BanModel: Add AfterSave event for plugins. Add hasEditProfile() to determine whether or not a user has edit profile options. OpenID Plugin: Make signing in with OpenID optional. Make YouTube embed work for playlists. Move site-wide message editing from the Garden.Messages.Manage to community managers. Move category management from administrators to community managers. Use asset() instead of url() for embed script. Relax the permission requirements for viewing the dashboard. Updated class.request.php to support non-standard ports. Insta-clear notifications when they are clicked. Add 400 code to MySQL range exceptions. Fix bug where too many stub discussions are created. Refactor Gdn_Format::Html() parsing to use new Gdn_Format::htmlFilter() and isHtml() to allow non-magic HTML parsing. Fix rotation of mobile image uploads. Fix the redefining of the schema in PermissionModel::define(). Moderation log: Check if user has personal info viewing permissions before displaying ip address. Refactor the validation object & permission model. Allow users with the user add/edit permissions to assign certain roles. Add a hidden Garden.Roles.Manage permission that can be opened up through plugins to manage roles. Make wall comments bump wall posts and status updates, and fix notifications. Don’t format wall notifications like wall posts. YouTube embed fixes: start, hyphens, ids. Change the default locale from “en-CA” to “en”. Add support for mentions in brackets: '(@someone)'. Turn the comment page cache off by default. Set empty DateOfBirth (0-00-00) to null when saving user. Don’t convert new tags to lowercase. Differentiate the ways users can be banned so that banning/unbanning a user won’t trample over previous bans. Reorder the arguments in AssetModel::cssPath(). Improve the Importer with reporting, optimizations, & data fixers. Update Dashboard news feed, add releases feed. Fix spelling mistake in the Garden.SSO.SyncRoles config setting. Fix comments not updating the latest post on categories in some cases. Fix discussion moving not updating category counters & latest post. Update the Facebook SSO addon. Add nofollow to social logins. Format Inform Messages excerpt as PlainText. Remove register link on sign-in form when invitation-only. Whitelist CSS classes in user content. Add PermissionModel::resetAllRoles() to end of import. Add the RoleModel::getDefaultRoles(), getAllDefaultRoles() & getByType() methods. Localize & encode reCAPTCHA options as JSON. Add a date to deprecated(). Improve exception handling to use 401 & 404 views & add traces to them. Add dynamic "lang" attribute to RSS feeds. Use the correct headline string for private messages. Fix UserModel::syncUser() so embedded SSO can pass roles. Change to camelCase functions and methods. Improve inline documentation & copyright notices. Change to lower case true/false/bool. Add braces to all if/else statements. Thanks! I ported it to the 2.2 branch too. Updated first post to indicate that you cannot downgrade after moving to 2.2 because of password hashing. You'd need to reset the password of any account that logs in under 2.2 to go back to 2.1. Its been a few days and no feedback? Guess i'll be the first one I upgraded my test env from 2.1.11 to 2.2b1. Upgrade went fine - forum still works i.e. no visible errors. I'm using Kaspers Bootstrap theme. So far only Resized Image LightBox plugin doesnt work. Love the new advanced editor, one question tho - how can i disable uploading via the editor? Or are you guys having any plans for a setting 'Disable upload/upload button' . Check out the Documentation! We are always looking for new content and pull requests. Click on insightful, awesome, and funny reactions to thank community volunteers for their valuable posts. Upload the new release's files so they overwrite the old ones. But on step 4: "Go to yourforum.com/utility/update to force any updates needed." @Dr_Sommer Did you use the new .htaccess file? What version of Apache are you using? I overwrote the old files with the new one, so ".htaccess" was also overwritten ( I rechecked on the old and the new files). is it the PHP5 Version? must it be exactly 5.3 or minimum 5.3? Minimum. I'd check your PHP error log next; that link takes me to a blank page. Start a new discussion to troubleshoot further. I've implemented Swipebox into my forum installation. I've installed 2.2b1 on a testdomain, upgrade went fine. One question: how do I enable the "advanced editor" (the one I'm typing this message in) ? I don't have the buttonbar. Thanks. You dont need buttonbar. 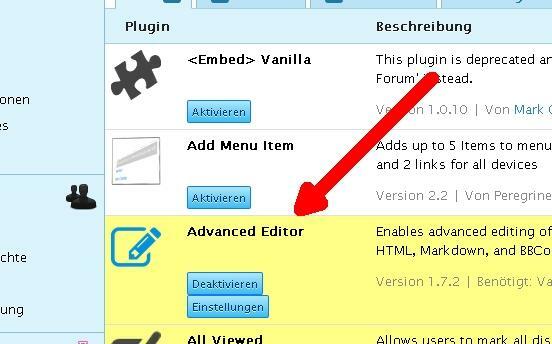 Just enable Advanced Editor in the plugin section. And you need to change InputFormatter in conf/config.php to 'wysiwyg' in you want WYSIWG editor. Thanks for the reply @CrazyLemon, there is no Advanced Editor the plugin section of the dashboard. I only edited the core because I wanted certain separation for file links and might allow other filetypes uploads later down. Thanks for the reply CrazyLemon, there is no Advanced Editor the plugin section of the dashboard. The /plugins/editor folder was there, but it was empty. Uploaded the pluging again. It's working now. Thanks !